The flavors of stuffed bell peppers, but not all the work! This Slow Cooker Stuffed Pepper Soup is an easy and healthy weeknight meal! 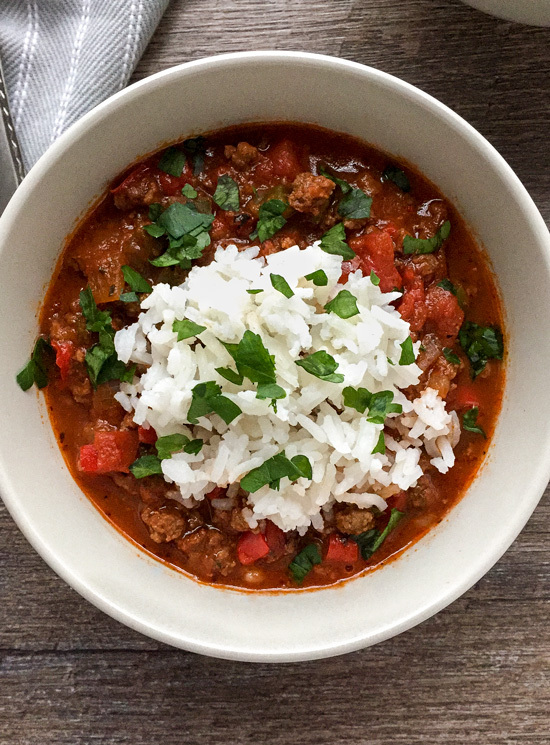 Kristin over at Live Simply Mom was recently saying on Instagram stories how much she was enjoying using the Skinnytaste Fast and Slow Cookbook. I decided to check it out of our local library to see if we might enjoy the recipes, too. It’s by Gina of the Skinnytaste food blog. It has several tasty sounding recipes, and one that stood out was a recipe for Slow Cooker Stuffed Pepper Soup. 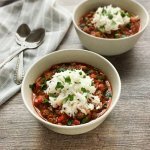 I love crockpot meals and my husband loves stuffed bell peppers, so I was pretty sure we’d both enjoy this stuffed pepper soup recipe. That’s where the inspiration for this recipe comes from. If you haven’t seen Gina’s cookbook or her blog, then you should definitely check it out. The recipes all seem to be fairly simple to make, which is really nice. So many cookbooks these days seem to only have a couple of recipes in the whole book that I might actually want to make, but this one has several. Do any of you run into that same problem? This is why I like to check cookbooks out of our local library before I invest any money in them. I’ll be honest, I have made stuffed bell peppers in the past and didn’t really enjoy eating them. My husband loves them, but I just don’t enjoy eating the whole bell pepper like that. Is that weird? Plus, it was much easier to make this Slow Cooker Stuffed Pepper Soup recipe. You can have it ready to go in the crockpot in no time, and then be off to do whatever it is you need to do. I know we can all use more healthy crockpot meals like this in our lives! Especially, if you are trying to eat a real food diet. I served mine with white basmati rice because that’s what I keep on hand, but you could use brown basmati rice or whatever rice you prefer. This Slow Cooker Italian Stuffed Pepper Soup features the flavors of stuffed bell peppers without all the extra work! Heat the oil over medium-high heat. Add the beef and let cook, breaking it up with a spoon or spatula as it browns, 4-5 minutes. Drain any excess grease from pan. Reduce heat to medium, add the onion and peppers to the pan and cook, stirring occasionally, until soft, about 6-7 minutes. Add the garlic and let cook for another minute. Transfer the meat/veggie mixture to a 4 or 5qt. crockpot. Add the rest of the ingredients and stir to combine. Cover and cook for 4 hours on high or 8 hours on low. Towards the end of cook time, make your preferred rice based on package directions. 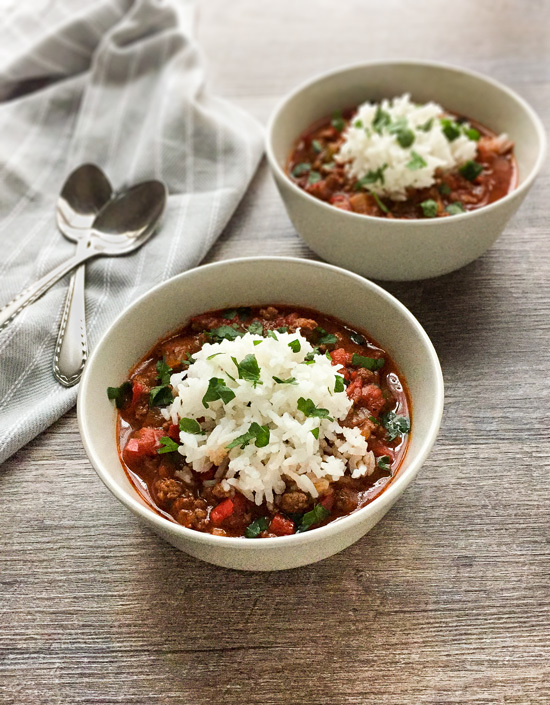 Place soup into bowls, top with equal portions of rice and serve right away. By Tempie at October 13, 2018 .